With a black finish and a polyester sling fabric, this chair complements many exterior decors. The Sling Chair is a great way to help transform your patio into an outdoor living or dining area. This stackable chair features a sturdy steel frame with a powder-coated finish and a durable, UV-resistant sling. The Gracious Living Contour Adirondack chair is the classic cottage-look redesigned with comfort in mind. The unique contoured design provides superior comfort. The built-in lumbar support provides maximum support for your pelvis, upper and lower back. The simple yet ingenious design lets you sit comfortably while you relax your back. Home Styles Biscayne Swivel Arm Chair is constructed of cast aluminum with a black finish. Features include powder coat finish sealed with a clear coat to protect finish, and nylon glides on all legs. Item Size: 24.4w 22d 33.46h. Seat height 16h. Stainless steel hardware. OPP Patio Sling Stacking Chair in Red With a black finish and a polyester sling fabric, this chair complements many exterior decors. The Sling Chair is a great way to help transform your patio into an outdoor living or dining area. This stackable chair features a sturdy steel frame with a powder-coated finish and a durable, UV-resistant sling. 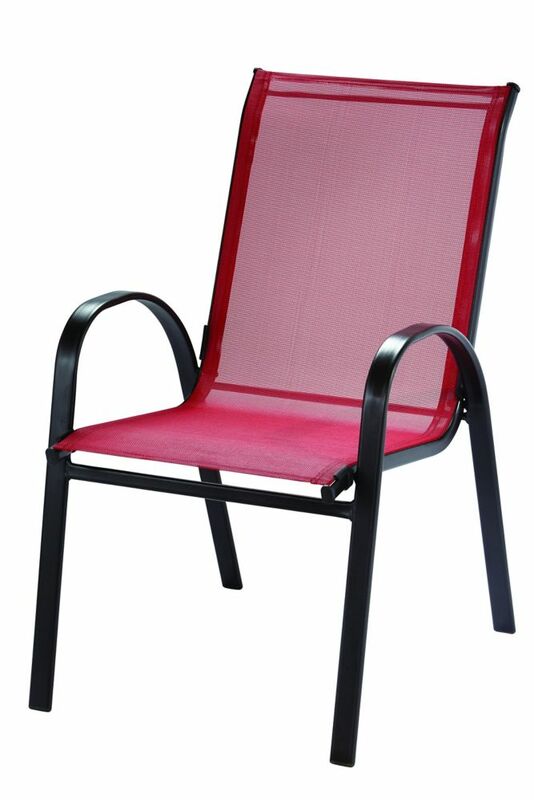 OPP Patio Sling Stacking Chair in Red is rated 4.7 out of 5 by 19. Rated 4 out of 5 by CHShopper from They look nice. Good value They look nice and make a bold statement being red. So far I like them. It's a little soon to say if they withstand the test of time. The arms were packed really well to keep them from getting scratched. Boy, was it hard to find this style of chair, they seemed to sell out really fast early in the summer. Rated 1 out of 5 by nic from Terrible I can't believe how highly rated these chairs are!! After one summer, ours have something - fungus, mold?- growing all over them and so of course, we don't want to sit in them. They will be thrown out. You get what you pay for. We had more expensive chairs outdoors made of a similar but somehow different material that lasted 13 years in the Florida elements with none of this stuff growing on them. Unless you like to clean your patio chairs constantly or are ok with sitting on dirty and unattractive chairs- look elsewhere. Rated 5 out of 5 by CWG22 from Comfortable, Bright and Sturdy I looked for chairs for my elderly parents to use on their porch. Saw several styles, bought one type and am taking them back after purchasing these. The others were supposed to be sturdy and comfortable but these were by far the choice of everyone and they stack. They loved the red color, ease of getting in and out along with comfort for legs and back. The matching rocking chair rocks nicely and was preferred by my mother and it adds a nice touch to their porch. These were cheaper overall than many we looked at which was a bonus since that wasn't our primary consideration for the decision. Wasn't expecting to be as impressed with these as we are and would recommend without any hesitation. Rated 5 out of 5 by LoyalHomeDepotShopper from Just what I wanted! The chairs are sturdy and good looking - for less than $20 … enough said! Rated 5 out of 5 by BarbequeBobby from Beautiful Outdoor Chairs These chairs are exactly what I wanted, not expsensive but made of good quality. when people come to my porch to ring the bell, they have a seat on my chairs and always give me compliments. I bought two of these chairs in red and added a white iron short table to sit between tnem. I can read on the porch or have a nice cold beverage on hot summer days. Rated 5 out of 5 by Tishy from comfortable, sturdy chairs I purchased these to replace some similar chairs that folded up. Same material, but these are so much stronger and sturdy.